The Theatre of Curious Acts is a dark fantasy novel from Cate Gardner. Returned home from the Great War, his parents and brother in their graves, Daniel walks a ghost world. When players in a theatre show lure Daniel and his friends, fellow soldiers, into a surreal otherworld they find themselves trapped on an apocalyptic path. A pirate ship waits to ferry some of them to the end of the world, helmed by Death. Already broken by war, these men are now the world's only hope in the greatest battle of all. I've been struggling with a way to describe Cate Gardner's writing. A few pages into The Theatre of Curious Acts I had to figure out how to highlight in my favorite reader app just so I could mark all of my favorite quotes. It was brain candy on a deeper level for me. The mix of Gardner's intelligent prose and her dark, visual tale had my brain all delighted. The Theatre of Curious Acts is located at the end of the world, but only the wise few will notice. The Theatre of Curious Acts is a unique tale of the four horsemen of the apocalypse. I felt like I was watching the apocalypse through a nickelodeon. Gardner had me walking through the mouth of a dragon and hopping aboard a pirate ship to the end of the world. It was a bit of a whirlwind with lots of vivid imagery. I really loved that the four horsemen were vile and memorable women, too. 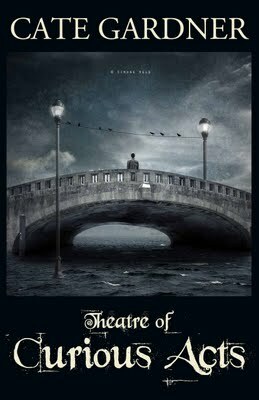 If you are in the mood for a dark and intelligent tale, you will find it in The Theatre of Curious Acts. Ooh I love the four horsemen stories I've never heard of this book before I'll have to check it out! Great review Jennifer! It's a goodun, that's for sure. It'll be on my faves of 2011 this week. Dark and intelligent...I'll write that down. Thanks for putting this on my radar. Dark, intelligent, broken soldiers, apocalypses... I honestly don't know what I should highlight from this book! I'm always a little worried when I hear about descriptive, particularly visual language because sometimes it means that I have to think too much while reading. I like thinking, don't get me wrong, but usually I read to get away from all the brain activity... Anyway! It sounds like this is not the case here, and I'll keep this one in mind. Thanks for bringing this one to my attention!